Ekaterina Bereziy, the CEO and co-founder of Skolkovo startup ExoAtlet, has been named one of the Young Global Leaders Class of 2017 compiled by the World Economic Forum. “She is changing the lives of those with spinal cord injuries with her robotics company that uses cutting-edge exoskeletons to enable people to walk again,” reads the description of Bereziy on the World Economic Forum website. Ekaterina Bereziy is the CEO and co-founder of ExoAtlet, which makes medical rehabilitation exoskeletons. Photo: Sk.ru. Bereziy’s company, ExoAtlet, is a resident of the Skolkovo Foundation’s IT cluster. “Each year, we select the most innovative, enterprising and socially minded men and women under the age of 40 who are pushing boundaries and rethinking the world around them,” the World Economic Forum description of the list of 100 people reads. Bereziy was one of just three people included in the Eurasia section, alongside Maxim Oreshkin, Russia’s Minister of Economic Development, and Nino Zamakhidze, chairwoman of the Georgian Farmers’ Association. 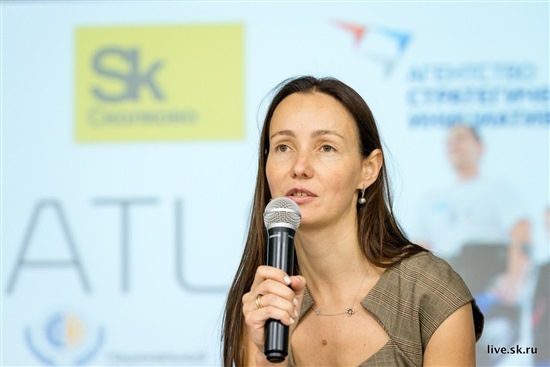 “Ekaterina is a true leader, and not just of the ExoAtlet team: she is changing the entire field of rehabilitation in at least a few countries,” said Igor Bogachev, head of Skolkovo’s IT cluster. Bereziy, who has headed ExoAtlet since 2013, graduated from the faculty of mechanics and mathematics of Moscow State University. Bereziy pictured with the first prize at the Startup Village in June 2014. Photo: Sk.ru. ExoAtlet, which is attached to the wearer like an external skeleton, enables patients to stand up, sit down, walk and go up and down stairs without assistance. Regular training in an exoskeleton improves the patient’s muscle tone and a range of other health factors, as well as their self-confidence and overall wellbeing, the company says. ExoAtlet won the RBC media group’s award for the Breakthrough of the Year last December, “for developing a product capable of changing people’s lives for the better.” The same month, the company delivered its first batch order of rehabilitation exoskeletons to Moscow clinics. The company, which grew out of a joint project between Russia’s Emergency Situations Ministry and a team of scientists from Moscow State University, won the first prize at Skolkovo’s Startup Village in June 2014 and became a resident of the foundation’s IT cluster soon afterwards. In 2015, it was awarded a grant of 50 million rubles ($793,000) by the foundation for the second stage of its development. Skolkovo's head roboticist Albert Yefimov, after whom one model of ExoAtlet was named in recognition of the help he has given the company, said that Bereziy’s work was capable of transforming the lives of millions of people for the better. “Robotics may not be the most significant industry in Russia, compared to traditional fields such as extracting hydrocarbons,” he told Sk.ru. “But its transformational effect on our civilisation should not be underestimated. The fact that our influence has been recognised by bodies such as the Davos World Economic Forum proves that we are in a global whirlpool of major impending change,” said Yefimov. The Europe section of the World Economic Forum’s list of Young Global Leaders included Pavel Durov, the Russian founder of VKontakte, a Russian analogue of Facebook. Durov, who also founded the secure messaging app Telegram and has since emigrated from Russia, was listed as representing Finland.